Tired of watching your down jacket’s warmth disappear in damp weather? The North Face ThermoBall™ Jacket gets around that inescapable downfall. ThermoBall's synthetic fiber insulation is organized in down-like clusters to trap heat in small air pockets. Meanwhile, it’s still a synthetic, so it provides heat when wet, giving you the best of all worlds. The Thermoball Jacket is also light and easy to pack down, making it convenient for layering or tossing in your pack. "Is this jacket long enough to cover a 6'2" man's backside? Thanks!" "No, this jacket is a mid-length so it may come down to your lower back. It would not completely cover your backside. " "Sarah - Thank you for your prompt response. It is appreciated." "Hithere. I need a understand of what Cosmic Blue looks like. In picture on your website its identical to black jacket. Is it just a black jacket with a blue zip line? Because that is what I am after. Thanks for the help"
"Cosmic blue is a deep navy blue color. The zip line is the same color as the rest of the jacket jacket. " I bought this jacket in TNF Red a couple weeks ago prepping for a late season trip to Mt. Whitney. Honestly the biggest selling point was the color and claim that the jacket performed better in damp conditions than regular down. It was the perfect weight/size for a mid layer, but I was skeptical about the warmth because its so ridiculously light and fairly thin. After 10 minutes on the mountain I was blown away. While the jacket retains heat during normal light wear, this thing comes into its own during high activity. 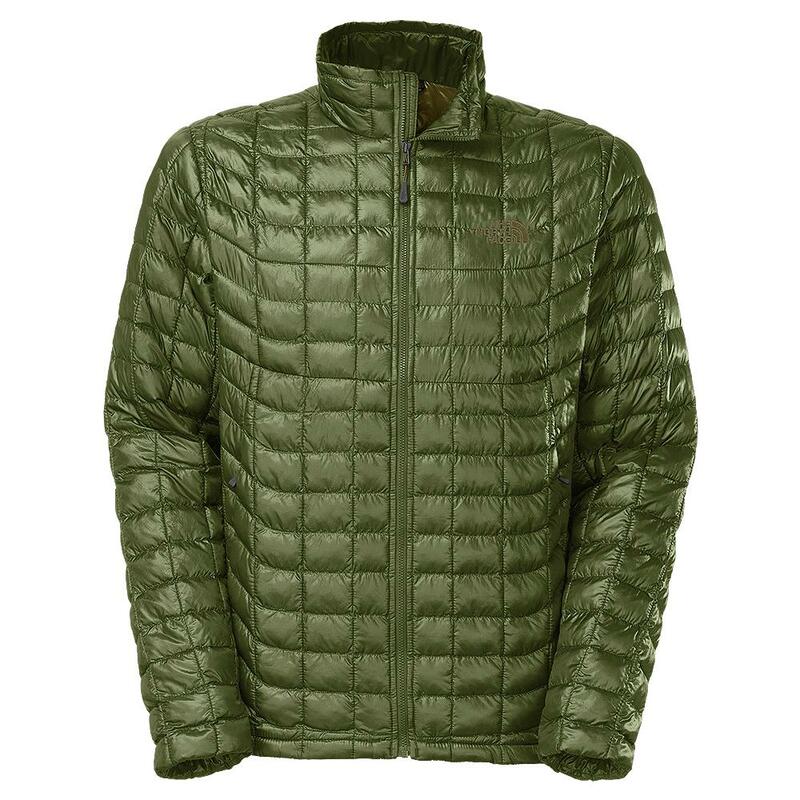 If you're generating heat, this jacket traps it, locks it in and keeps you cocooned in warmth. I used it in temps between 10F-20F in dry-to-snowy conditions and would highly recommend it as an essential piece of gear. I purchased this jacket in a light blue and it has a navy blue liner. Nice jacket and functional. However I noticed after a few months the colour of the jacket starting to go weird. Upon closer look, the colour along all the seams was getting darker from the rest of the jacket. I figure it must be the navy liner bleeding through and this quilted look has a lot of threading. I washed it and no improvement. So the little sections are blue but all the thread lines are bleeding dark blue. The store manager doesn't consider this a functional defect so no warranty help. Now just a weird looking jacket. I expect an item of this price to perform and look better. DO NOT BUY THIS JACKET UNLESS IT IS ALL BLACK. love this jacket. it is lightweight but warm. i live using it when i travel because it is not bulky and can be packed easily.. This jacket is unbelievably light weight, yet keeps you super warm! I have no idea how they do it. It's magic. Lost mine on an airport and just bought it again. It is a great product! Stayed warm while hiking in the snow in 10°F with just a T-shirt underneath. I use this product for windy cool days walking to class and when I go hiking. This jacket works so great. Garment is listed as "standard fit" meaning a tad more room for layering. Zippered internal chest pocket was the winning ticket! Warmth when wet....yes! Awesome insulator layer or nice to wear alone on warmer winter days. These jackets are great! I bought several of them for employee gifts and everyone loved them. They look beautiful and they were a great price. Looks great and feels great. Used for casual use and while snowboarding and it works great. I wear it alone and with a hoodie under it when in the snow and it fits fine either way. Would recommend. Fantastic as a stand-alone or layering piece. I live in Calgary, Canada - the weather can switch on a dime. This piece is comfortable from -15 to +20 C - it truly is that versatile. My go-to for camping, backpacking, aircraft travel (warm, lightweight and small), and just hanging out. Its temperature/comfort range is truly remarkable. Only issue (and this is new) is sizing - I purchased my second one last month (mens large, just like my original bought 3 years ago), and it was too big - chest shoulders and sleeves - but sold it to my slightly larger camping buddy. Check TNF's sizing charts carefully and/or try on before purchase. Still, and all in all, the best jacket you can buy in its category, hands down.